Can you remember your first hot dog? 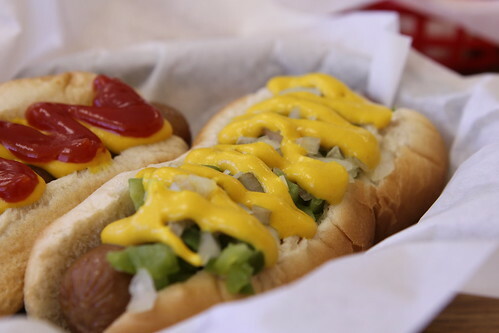 I wish I could; nowhere in the myriad of dirty water dogs, chargrilled ballpark franks, or lucky dogs of my nascent years is there any one particular hot dog that stands out in my mind. 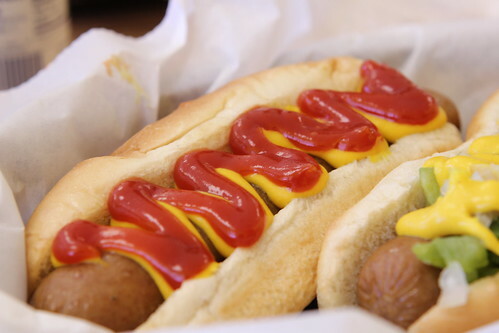 Sure, I’ve relished those first ketchup slathered then later mustard topped tubes of meat since day one but it wasn’t until a few years ago that I really had a hot dog epiphany. Growing up a hot dog was a hot dog. While my family may have always purchased the black labeled ballpark franks, it wasn’t a conscious decision. No it wasn’t until I made it to college that I discovered the majesty of the all beef wonder that goes by the name Hebrew National. There a few fraternity brothers made the valiant effort to keep kosher. Once I tried that ConAgra specialty, things changed. It was an all beef revelation and the mystery meat dogs of my youth were quickly forgotten. The only reason I bring all this up is that I recently heard of a relatively new restaurant that serves only hot dogs. 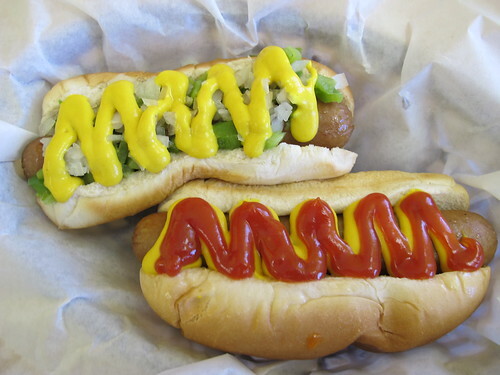 Aptly named The Hot Dog House, it features Nathan’s hot dogs and a succinct menu of seven varieties. There’s just one problem, it’s on the far end of Flowood. 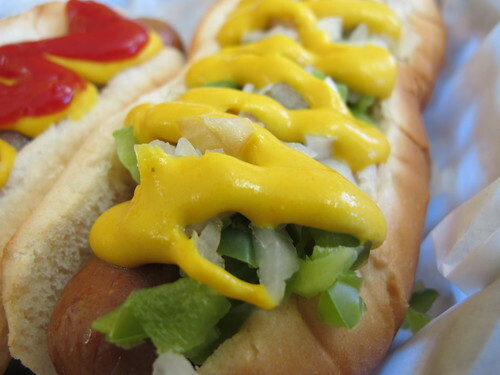 Of course, when a good hot dog is concerned, what’s a little extra drive to stoke the appetite? When faced with a menu of various toppings, the rational thing to do would be to try two maybe three dogs and save the rest for another time, but that’s boring. After ordering one of all seven hot dogs on the menu, I sat back to see what owner Ben McCain would bring to the table. After a few minutes of scrambling around his meager kitchen, McCain emerged with four trays of hot dogs. First up was the Chicago dog. I will freely admit that I am not very well versed in the language of Chicago dogs, but I was surprised at how this tasted. 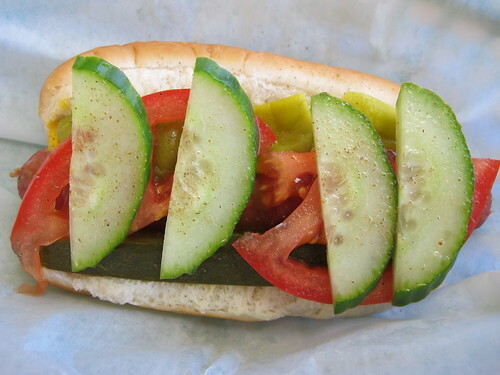 I was expecting the heat of the sport pepper and the vinegar of the mustard to dominate but after enjoying the juiciness of the steamed Nathan’s dog, it was all pickles and cucumbers. The second tray contained the first two dogs on the menu, the house dog and the New Jersey dog. As you can see, the house dog on the bottom is the all time classic toppings of ketchup and mustard. Frankly, it’s hard to beat neon colors of French’s mustard and Heinz ketchup. Moving on to the New Jersey dog, the choice of toppings was a little confusing. Green peppers, onions, and mustard? What exactly makes this a New Jersey topping? When I read New Jersey dog on the menu, I was halfway expecting a deep fried ripper dog, but the pungent punch of chopped onions and green peppers had its own charm. 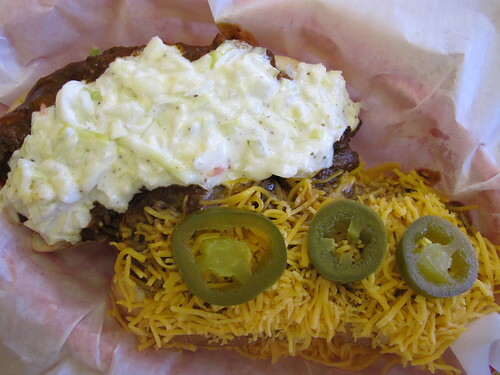 The next duo was the Carolina dog and the Texas dog. There was nothing subtle about this combination. 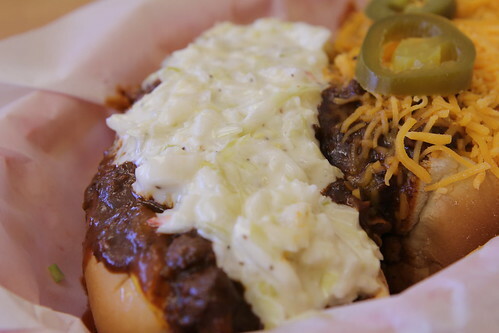 With an abundance of chili, coleslaw and cheese, this pair would take a little work to attack properly. 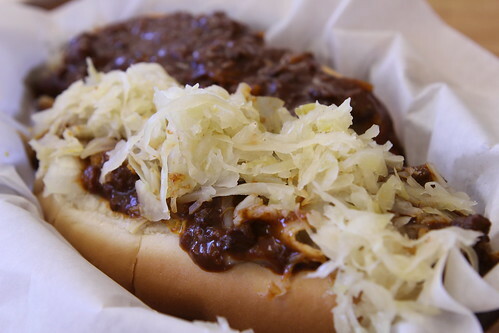 If there was one thing that dominated the Carolina dog, it was the cole slaw. It was sweet, crunchy and it muscled its way across the entire dog, but in a good way. 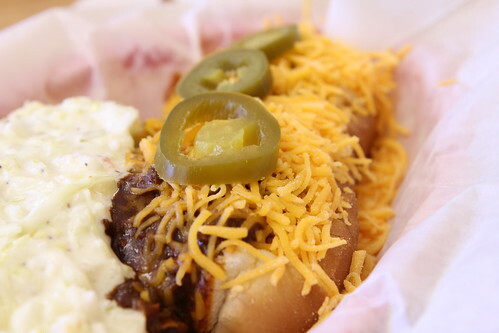 The Texas dog, it looked big and brash. Covered in chili and cheese and topped with sliced jalapenos, I was hoping for Texas sized bite of forward flavors, but was a little let down. The chili was subtle without any heat or noticeable cumin flavor and the jalapenos were pretty tame for a hot pepper. I asked what went in the chili and was disappointed to hear that McCain uses a bagged, frozen chili. He said he experimented with different chili recipes but the premade chili tasted best to him. Rounding out the menu was a Georgia dog and a Mississippi dog. 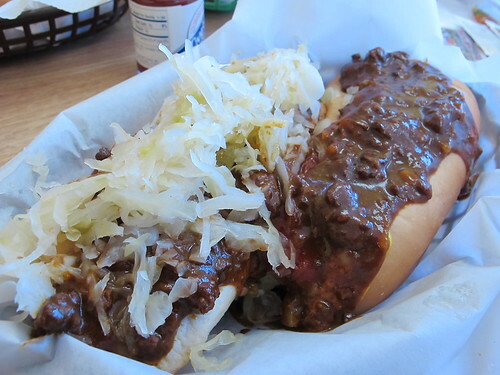 The Georgia dog on the right consists of chili, mustard, onion, and ketchup while the Mississippi dog on the left is topped with sauerkraut, chili, onion, and mustard. Once again, I have no idea why these toppings are associated with these locations but I just went with it. 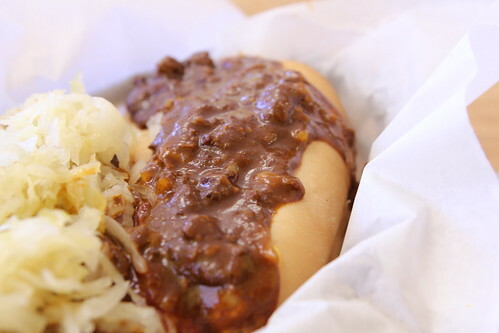 As for the Georgia dog, it’s all hot dog and chili with a nice hint of mustard to round out the flavor. 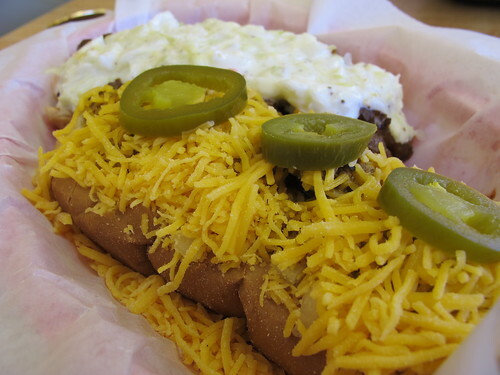 Saving the home state dog for last, I delved into the Mississippi dog. I don’t eat sauerkraut very often but this had a distinctive musty taste that dominated the whole dog. With a taste too reminiscent of old pickling spices, I had to put this dog down. Having gone through the entirety of the menu, I was brimming with questions about the setup of The Hot Dog House. As for the odd variety of names and topping combinations, apparently McCain kept the same menu as the previous owner and hasn’t really made too many changes yet. If you’re like me, you may be wondering why McCain went for Nathan’s hot dogs over Hebrew National, and according to McCain, it was simply a matter of taste. McCain prefers Nathan’s to Hebrew Nats and I can respect that; I may not agree, but I can respect it. If there was one real let down to The Hot Dog House, it was the preparation of the hot dogs. When I first read the menu and saw the New Jersey dog, I was hoping for a deep fried ripper dog. 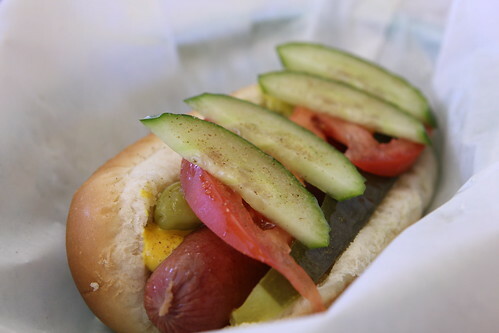 I had imagined a menu of hot dog oddities a la Hot Doug’s in Chicago or at least a bacon wrapped sanora dog or two. Unfortunately, due to zoning restrictions, McCain is only allowed to use a steamer. With that crushing limitation in mind, McCain has actually done quite well for himself. There’s nothing wrong with a steamed hot dog, but I’m a griddle man every day of the week. Fortunately, McCain has plans to expands his menu and maybe get around the crushing limitations of his zoning restrictions. In the meantime, pay The Hot Dog House a visit and see what McCain has to offer. I only wish it wasn’t on the far end of Flowood. I love a good dog, but driving 20 minutes across town can get a little old. Mezza, having opened around the start of the year, is a new face in the strip malls of Madison and when I first heard of it, I had high hopes. Opening a Lebanese eatery in Jackson is an ambitious task and it’s even more daunting when it’s opened amongst the brick facades of Madison. So with a new restaurant in town, it’s like the smell of fresh cut grass and sunscreen, hot dogs and overpriced beer, there’s a new season of ball just waiting to be enjoyed. With the scouting report from For Better or For Wurst, Sam and I set out to see what a new season of cuisine at Mezza had to offer. 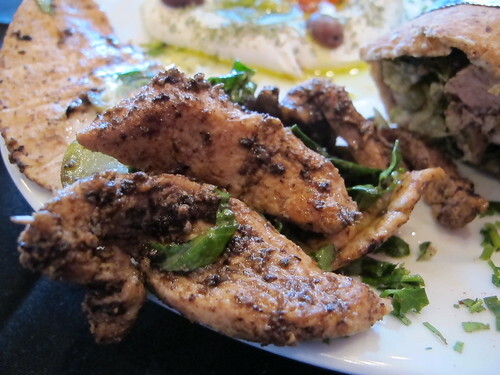 As you’d expect, Mezza does live up to its name and offer a nice variety of mezza or small plates. Full of all your Mediterranean favorites, the mezza section really does read like a greatest hits lineup of Arabic appetizers. 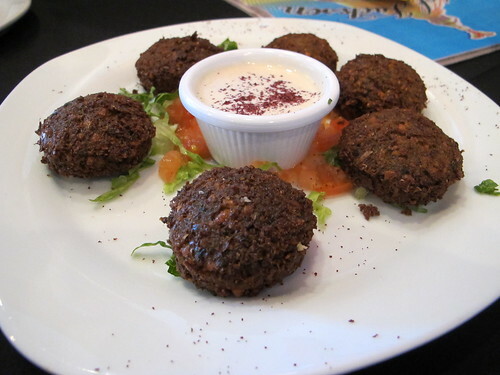 Hoping to get a runner on the bases, we started with the crowd favorite, falafel. So far it’s looking like a good at bat; the falafels have a good shape and they’re well fried. 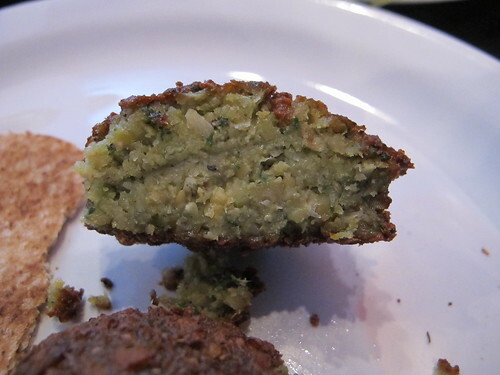 I know the shape comes from a falafel disher but that’s a good-looking crust. Unfortunately the lead man went down looking. 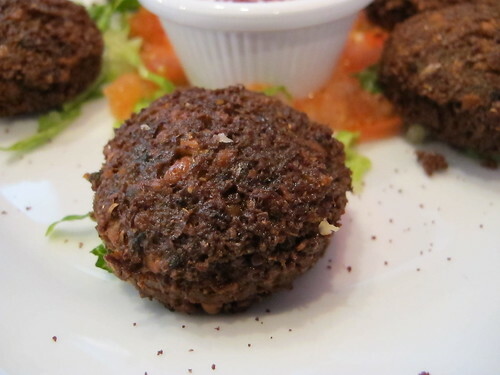 These falafels may have had the looks but they were under seasoned and chalky. With a little batting practice and salt, they might have a chance, but I won’t be holding my breath. 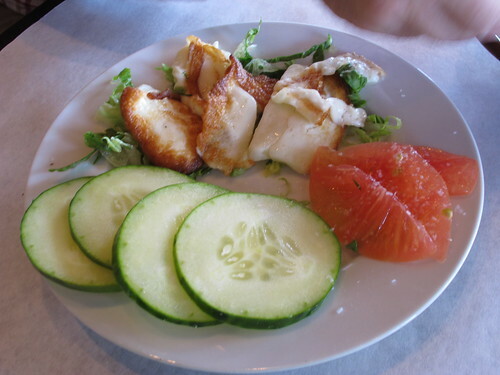 Next in the appetizer lineup was one of my personal favorites, the halloumi cheese. With this dish, all you need is a lot of pita bread to soak up the glorious pools of olive oil, parsley, garlic, and cheese. Well, that’s what I was expecting. 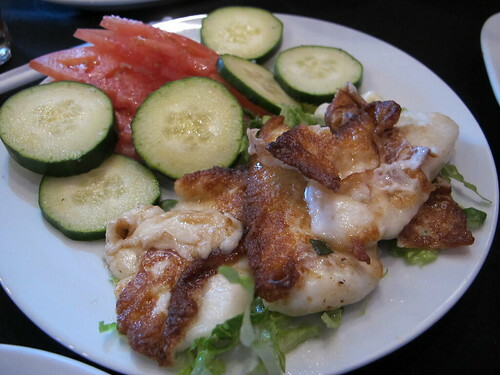 Instead, this was a few slices of halloumi cheese sliced and fried on a griddle. 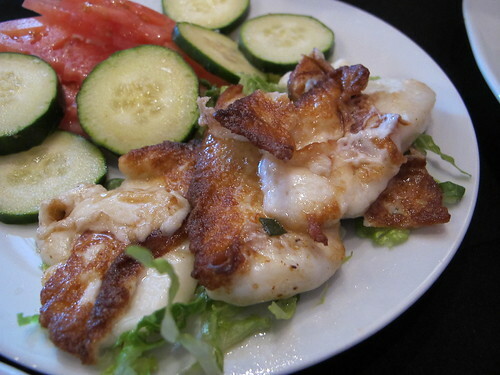 It was still the tangy halloumi cheese that I love, but the dish had been cut off at the knees. While this may have been an attempt to be slightly health conscious, instead it was a bland failure. We’re up to the third batter and this dish had better be hitting for average. It’s the house version of hummus, and just to make it extra special, I added the optional lamb. 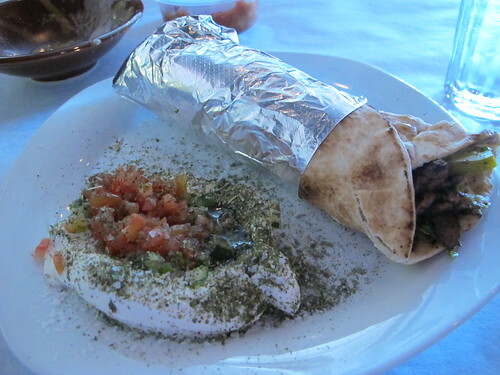 Frankly, $5 for hummus and $6 for lamb is outrageous but that’s neither here nor there. There’s a good consistency to this hummus but where’s the seasoning? 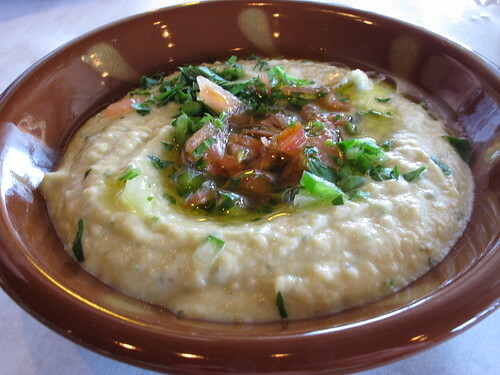 It may look like there’s parsley and sumac on the hummus but they don’t show up in the taste. 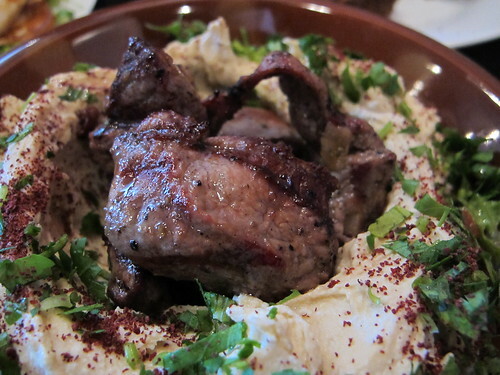 As for that lamb, it did add a nice meaty flavor to the hummus but it too was missing the basic seasonings. I know I like bold flavors but this lack of seasoning was getting ridiculous. 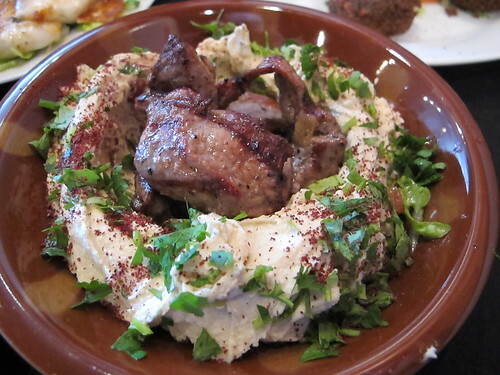 I’ll be generous and say that the hummus & lamb got on base but only because I like lamb, even under seasoned lamb. That means, it’s time for the cleanup hitter and Mezza brought out the big guns. 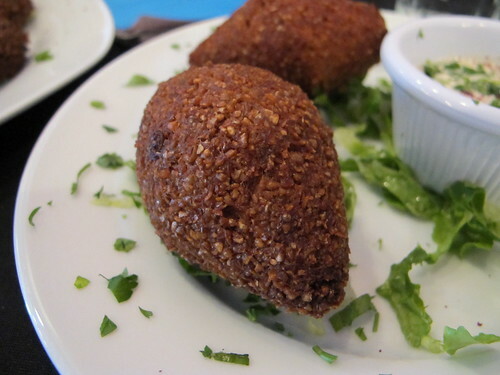 Kibbeh torpedoes are one of my favorite Arabic dishes and why not? It’s ground beef with bulghar wheat, pine, nuts and a flavor to die for. 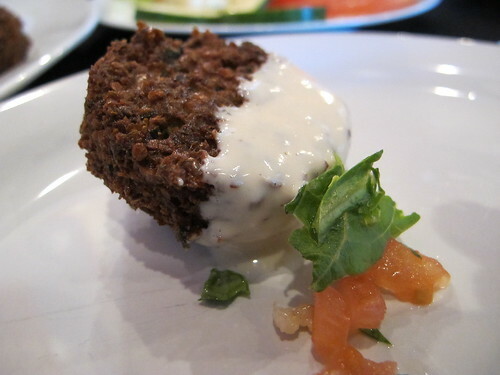 Fried in the shape of a torpedo or served raw as kibbeh nayyeh, I’ll rarely turn down an order of kibbeh. Once again Mezza has the frying down to a fine art but where’s the flavor? 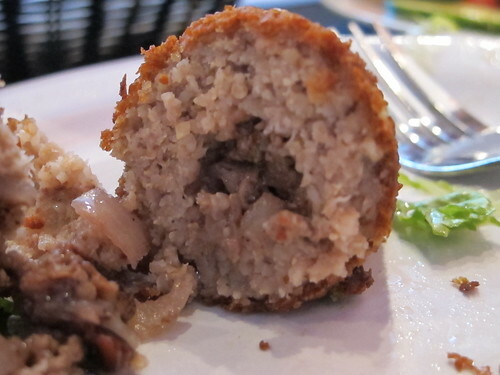 This kibbeh was lacking meatiness, pine nuts, and any sort of seasoning. I can understand that the diner is supposed to appreciate the flavor of the meat but this is well fried blandness again. Needless to say, we left the first inning with Mezza leaving a runner stranded and the whole team looking rather anemic. Between innings, Sam and I debated the idea that Mezza was toning down the flavors for the Wonderbread palate of Madison. Another theory is that the chef was more concerned with presentation than flavor. I’ll admit, most of the plates so far were very visually appealing but without a good flavor, I don’t care if it looks like a damn Van Gogh. 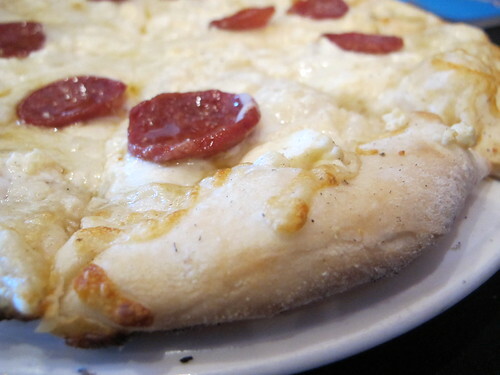 After a quick hiatus, Mezza was back at the plate with a dish from their section of wood-fired pizzas. 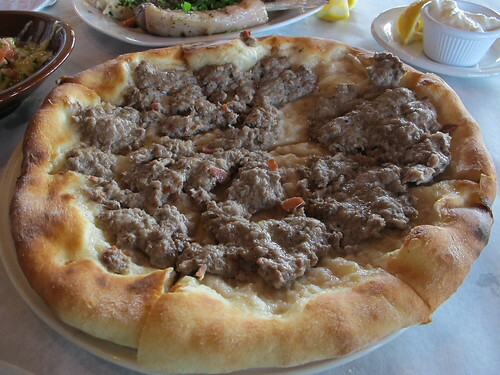 I’ll freely admit that I ordered the sujuk pizza because it had sausage on it, mainly because this was the first time I’ve seen sujuk on a menu in Jackson. Sujuk is an odd sausage. It’s smoky, juicy, and has an almost dusty texture but it’s delicious. 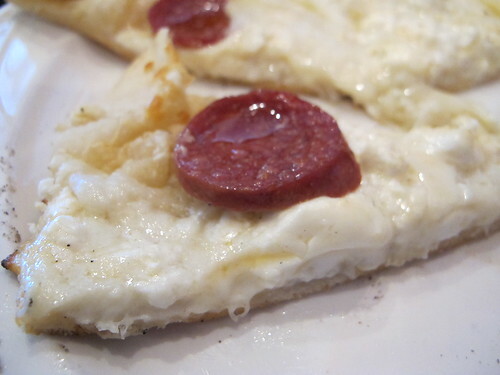 Unfortunately, unless I’m underestimating Mezza, the sujuk is something you buy premade. When it comes to something that Mezza made, i.e. the crust, it was another sad at bat. Like a cross between pita bread and pizza dough, this dough was far from the crispy textural delight that I expect from a brick oven. 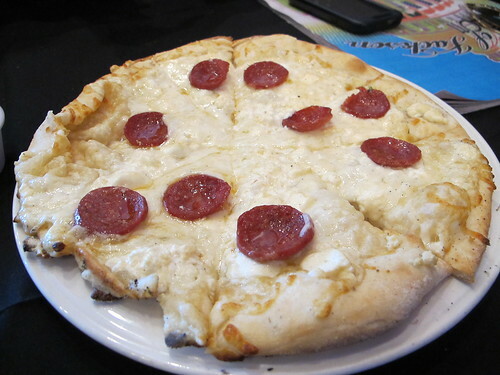 This pizza, outside of the sujuk, just wasn’t very good. Next in the batter’s box was a chicken shwarma sandwich. This sandwich featured a combination of marinated & grilled white meat chicken, Lebanese pickles, and a creamy garlic sauce. and each bite of this sandwich brought the juiciness of chicken, the crunch of the pickle and the creaminess of the garlic sauce. There wasn’t any real standout flavor, everything simply meshed to create what was by far the best dish we tried that day. For all the goodwill the chicken shwarma sandwich had fostered, it was forgotten with the appearance of the kafta kabob sandwich. Right away, I tried the meat on its own and I knew this wasn’t going to be a very good kafta kabob. 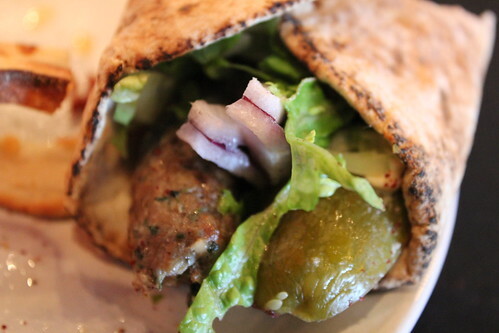 As a poor mix of beef and lamb, this kafta had barely enough flavors to stand on its own to legs but when stuffed in a wrap with pickles, red onions, and hummus, any chance the kafta had to shine was lost. Even the hideous look of a rally cap was no match for the sad flavors Sam and I tried at Mezza. Six dishes down, we left at the end of the second inning. However, this first meal was early in the season. Mezza had only been open a few weeks. Maybe they were still suffering a few new restaurant jitters. So, with high hopes, I paid Mezza a second visit a few weeks later. Excited to see if things had been turned around, I went right back for one of the worst plates of the first visit, the halloumi cheese. It was a disheartening case of déjà vu. The cheese was still bland and still boring. Maybe I had been trying the wrong appetizers. 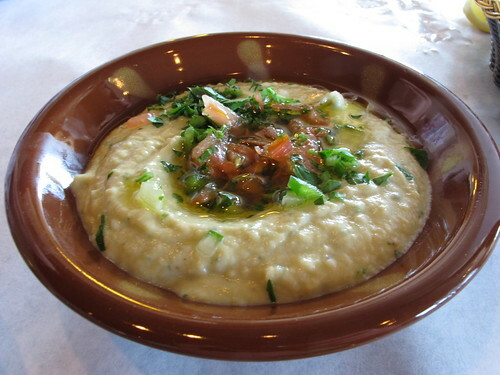 To see if I had gotten off on the wrong foot, I tried an order of the baba ghanoush. 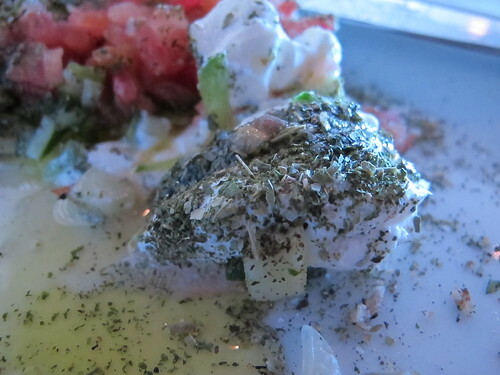 Like so many other dishes as Mezza, this dish had the right textures. It was smooth and creamy but each bite was smoky and bitter. The whole bowl had the acrid taste of unsalted eggplant. Feeling extremely gullible, I decided to try the other meat centric pizza on the menu, the lahm bi ajeen. 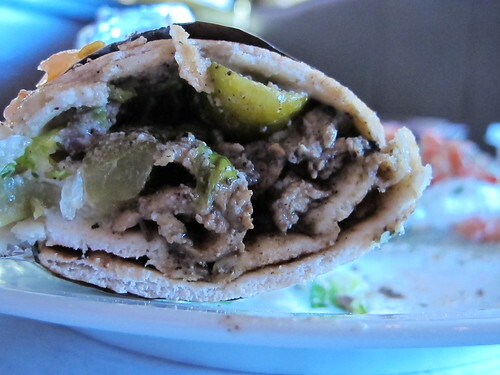 This was described as Lebanese meat or ground beef with chopped tomatoes and onions, but it didn’t really matter. This pizza was a mess. The center was sopping wet, the edges were crispy, and the beef topping fell off if you even looked at a slice. 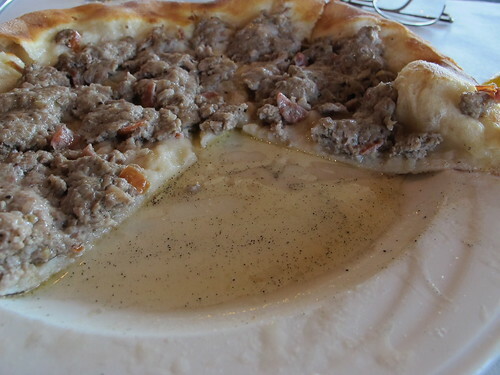 The whole pizza was sitting in a pool of meat juice and oil and it was just a soupy disaster. After one slice, I stopped eating the pizza and that drew the attention of my waiter. I complained about the pool of oil and juice under the pizza and he explained that was the nature of the meat and onion topping. I was dumbfounded. Of course that’s the nature of raw beef and onions, that’s why you don’t put that combination on pizza. To Mezza’s credit, he did offer to comp the pizza, but I’d prefer to pay for well prepared food than be compensated for poor dishes. At this point, I was becoming both annoyed and desperate. 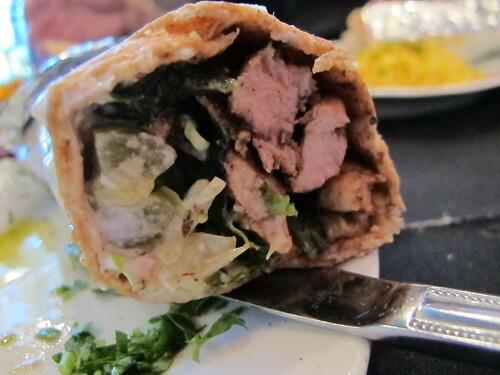 Surely there was another chicken shwarma sandwich on the menu, something that would make this second visit worthwhile. 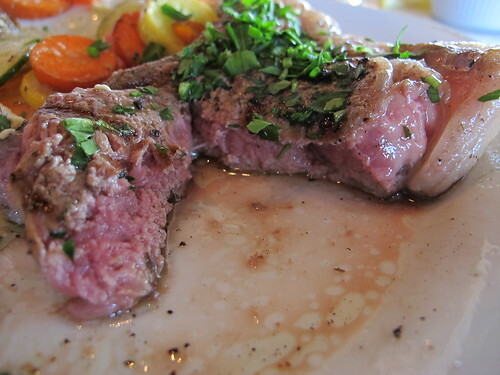 In an act of desperation, I tried the grilled lamb entrée. Again, the presentation was stunning. 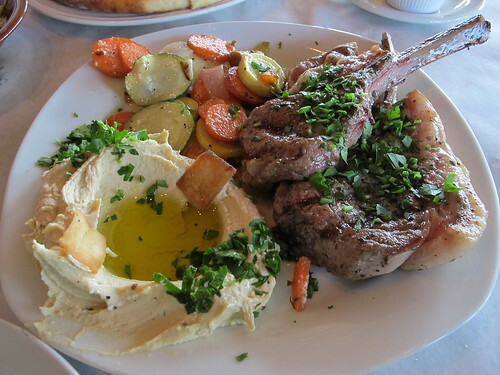 The hummus, the lamb, and the mixed vegetables all made for a very appealing plate. 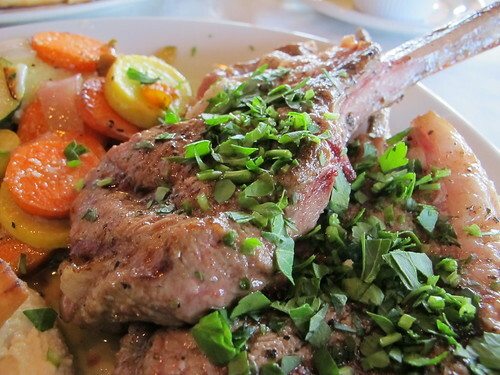 These lamb chops were big & fatty and appeared to be quite well cooked. 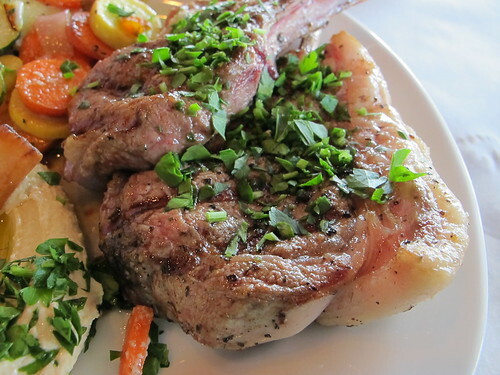 It really is rare to see that much fat on a lamb chop. Unfortunately, once again, the looks of the dish did not back up a quality product. 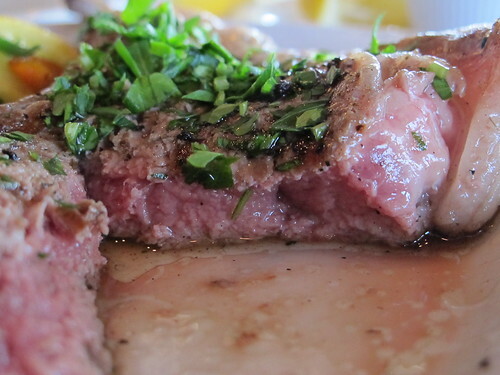 I enjoy a pink lamb as much as anyone but I need some char, I need a crust for the sake of contrasting textures. This was just gummy, undercooked, fatty lamb. The parsley was a nice topping but there was no lamb taste and no caramelization. With the second visit behind me, we were past the all star break and I had all but written off Mezza. Even though I had enjoyed the chicken shwarma sandwich, it wasn’t enough to justify continued visits. Still, something in the back of my mind prodded me to pay this strip mall hide out a third and final visit. Having tried most of the mezza section of the menu, I went out on a limb and ordered the moussaka. 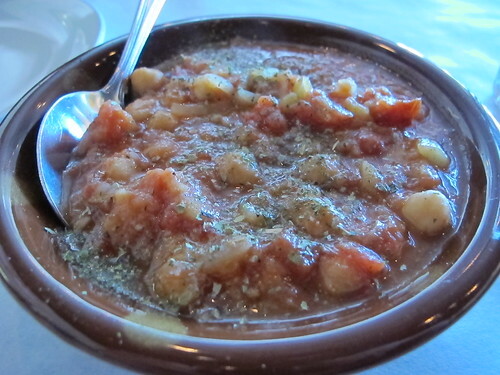 Soupy and simple, that’s how I would describe this dish. Actually I take that back. 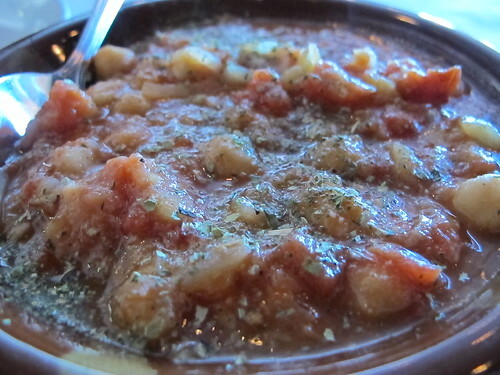 This tasted like some watery tomato sauce with chickpeas and onions. There might have been some eggplant in there, but unlike the baba ghanhoush, there wasn’t any overpowering bitterness to let me know where it was hiding. Taking a stab in the dark, I also ordered a serving of the batata. 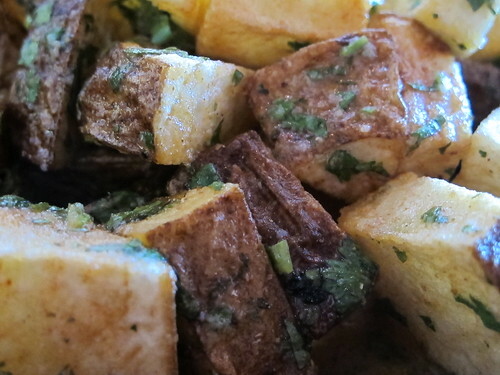 Little more than fried potato squares with a cilantro-garlic paste and lemon, this was surprisingly delicious. The potatoes were crisp and perfectly complimented by the acidic pungency of cilantro, garlic, and lemon. Sure, the sauce may quickly turn the potatoes soggy but even then, it was still good to the last bite. 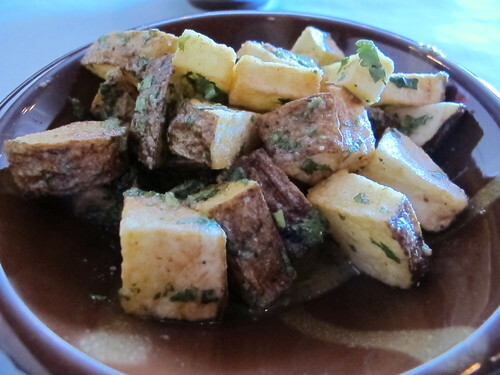 The batata may have been a simple dish but it was one of the best at Mezza. After trying so much of the menu, I was tired of finding so many disappointments. For my last entrée, I went with a tried and true dish, the chicken shwarma sandwich. This time, the sandwich came with a side of labne. Much as before the chicken was juicy, the pickle provided a crunch and a bit of acidity and the whole sandwich was quite enjoyable. I do wish I had gotten more dark meat like the first time to keep things a little juicier but it’s a minor quibble. 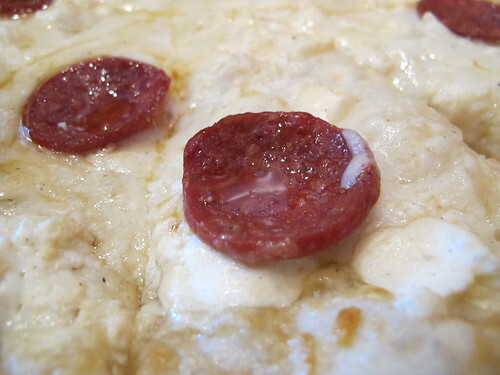 As for the labne, it’s just thick yogurt topped with olive oil and little seasoning. There’s nothing special here, but it’s still a decent side. After three separate meals, it was like September. The playoffs are around the corner and it’s coming down to the wire, but when your team is in last place, you really stop caring. I think I’ve tried enough of what Mezza has to offer and while I appreciate the effort to open a new and relatively different restaurant in Madison, Mezza really wasn’t worth my time or money. Yes, there were a few dishes that I really enjoyed, namely the chicken shwarma & the batata, but most everything else was a dizzying array of flat seasoning, poor textures and generally subpar preparation. 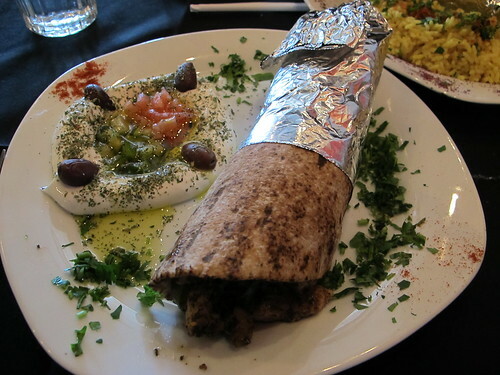 There may not be very many options for Lebanese or Mediterranean cuisine in Madison, but I’ll happily make the schlep to Jackson for Aladdin or Petra before I head back to Mezza. In the end, I felt like I gave Mezza ample opportunity to impress and every time they went down swinging.